Will Tony and Rachel decide to leave the Bay together? Xavier hopes Rachel and Tony can stay together. John subtly quizzes Gina on what she thinks of marriage. Tony is furious at Rachel for dragging Lucas into their problems and John suggests to Tony that he talk to Gina. As Rachel talks things over with Leah, she receives a phone call from Lucas who’s plane has been grounded due to a storm. Rachel realises Lucas can’t make it at all and now has no idea how to get through to Tony. Gina tells Tony he’s being childish and to listen to Rachel. Rachel suddenly has an epiphany and realises why Tony doesn’t want to leave – because he doesn’t want to leave the place that Jack lived in and was buried in. Rachel assures Tony they can both stay in Summer Bay. Tony is so thrilled by Rachel’s sacrifice that he decides to go with her to Boston after all. He comments that if he was to stay here purely to stay with Jack, then he may as well be in the ground himself. Meanwhile, when Alf mentions ‘marriage and Gina’ to John, John brushes it off. But John subtly starts quizzing Gina on her take on marriage. Even though she’s had a rough time in relationships, she wholeheartedly believes in marriage and John is pleased to hear it. But just why is he asking? 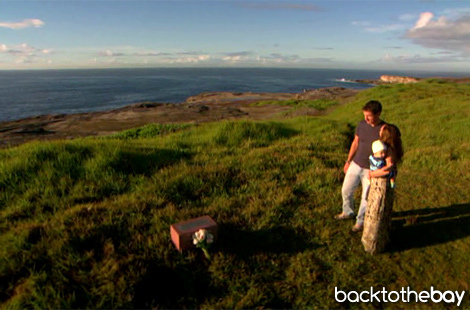 On the clifftop, Tony says a final goodbye at Jack’s graveside. He tells Rachel that he’s ready, and they walk away to their new life.